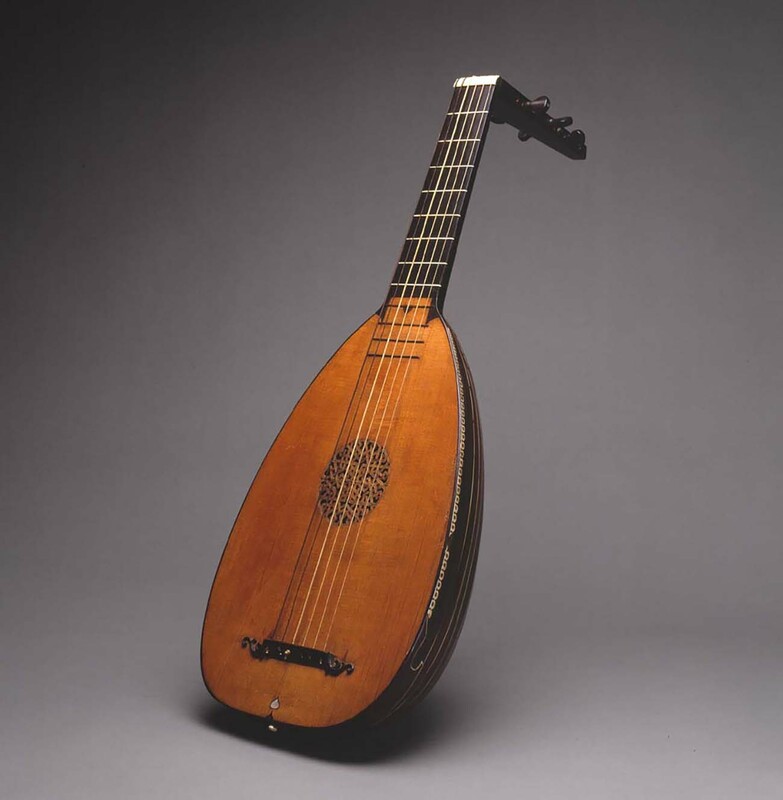 A closer look at the music of the Renaissance courtly experience. 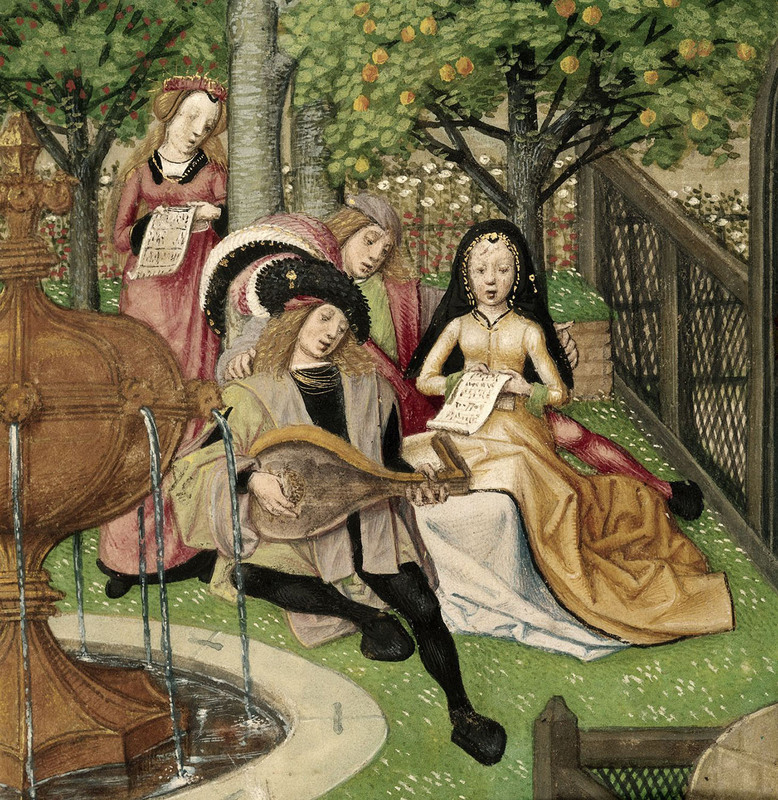 Music was an integral part of the courtly experience. It both complemented and enhanced the visual spectacle of luxury fashions, illuminated manuscripts, tableware of fine polished metals, large and intricate tapestries, and other material trappings of the royal courts of Europe. Like manuscripts, paintings, and other works of art, musical pieces were often created on commission at the behest of powerful patrons. Just as there were official court artists employed by European monarchs, so were there court musicians, both composers and performers. Musical performance took place before an elite audience in the socially exclusive spaces of the court. 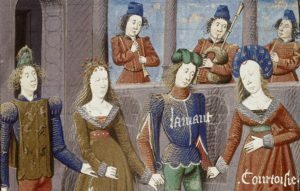 The images above and below of musical performances at court are drawn from late-fifteenth-century copies of the Roman de la Rose, a tale of romance that was extremely popular among courtly readers. They give modern viewers a sense of how music might have been experienced in the exclusive space of the court. 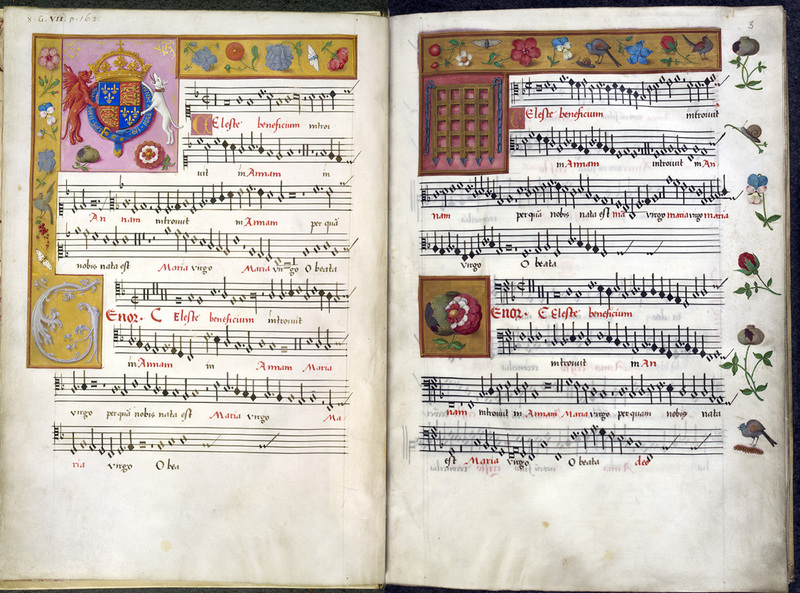 Many of the compositions from this period are preserved in luxury manuscripts that record their musical notation. These manuscripts were very much at home in the book collections of Europe’s elite. 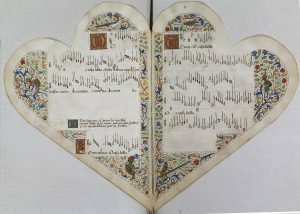 One chansonnier, a collection of love songs (chansons), from the late fifteenth century was constructed in the form of a heart and its borders illuminated in a traditionally medieval manner, with scrolling floral decoration populated by mischievous hybrid creatures. O rosa bella by John Bedyngham, Chansonnier cordiforme. France (Savoy), ca. 1475. Paris, BnF ms. Rothschild 2973, fols. 8v–9. Source gallica.bnf.fr / Bibliothèque nationale de France. The advent and popularization of print from the middle of the fifteenth century in Europe had a profound effect on musical culture. 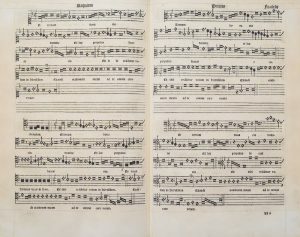 Musical pieces were printed far more inexpensively than had previously been possible, were distributed far and wide to a much larger audience, and many more people owned and learned to read musical notation, enabling the growth of what might be called a shared popular music culture across Europe. Miniature of the royal arms of England and Devices of King Henry VIII in a Book of 28 Latin motets by Josquin des Prez, Pierre de la Rue and others, workshop of Petrus Alamire; Netherlands (Mechelen), 1513–ca. 1525; London, British Library Royal Ms. 8 G.vii, fols. 2v–3. Image: British Library. A collection of masses printed in single-impression movable type. Pierre Attaingnant, compiler. Douai, France; Primus Liber [Septum librorum] Viginti missarum. Parisiis in vico Cithare : apud Petru[m] Attaingnant, 1532. Boston, Boston Athaneaum, $XB //At81 //1532. The first major printed collection of music was published in 1501 by Ottaviano Petrucci in Venice. Other printers, including the Frenchman Pierre Attaingnant, refined the musical printing process. 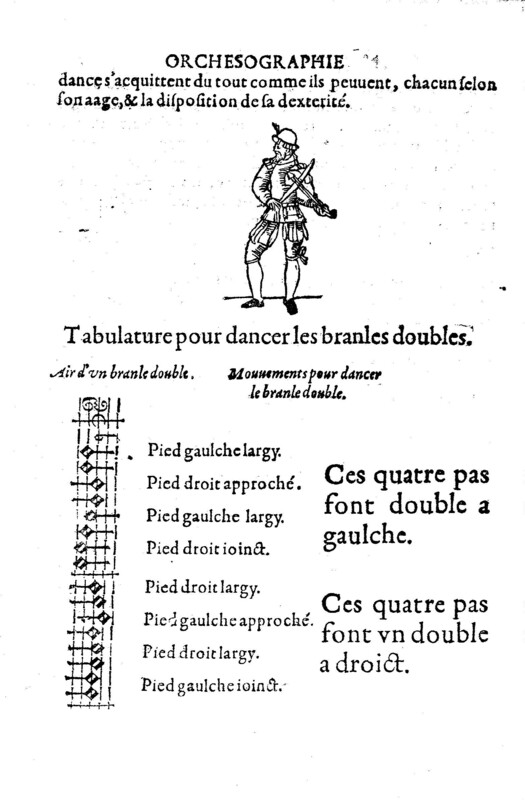 Attaingnant was the first to use single-impression movable type for music printing, making it possible to produce more copies cheaply and quickly than Petrucci and his other predecessors. 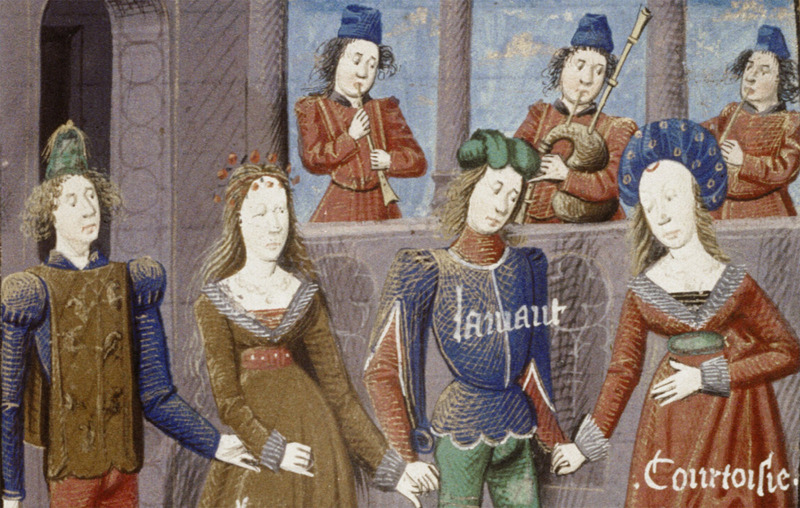 Above: Listen to “Prenez sur moi,” by Johannes Ockegham, performed by the Orlando Consort. During the late medieval period, polyphonic music (made up of several melodies played at the same time) in the form of masses and motets was performed in Latin for important churches and court chapels. However, over the course of the Renaissance, patronage grew much more varied, and encompassed not only the Catholic church, but also Protestant churches and a variety of secular outlets, including courts and other wealthy households throughout Europe. One of the most influential European composers of this period was Josquin des Prez (ca. 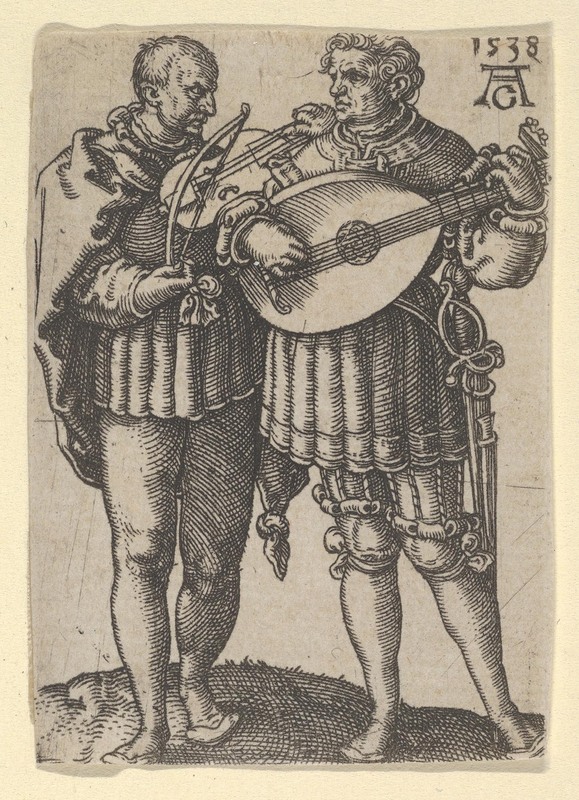 1450–1521), part of a group of Franco-Flemish figures that dominated the musical scene. He helped to develop an increasingly complex polyphonic style while also creating fluid harmonies based on intervals. Josquin composed both religious and secular music, producing many Latin masses for church, but he also set French poetry that was popular among courtiers to music and arranged instrumental songs that proved extremely popular among elite listeners. Above: Hear Si j’ay perdu mon amy, Josquin des Prez, performed by Piffaro. 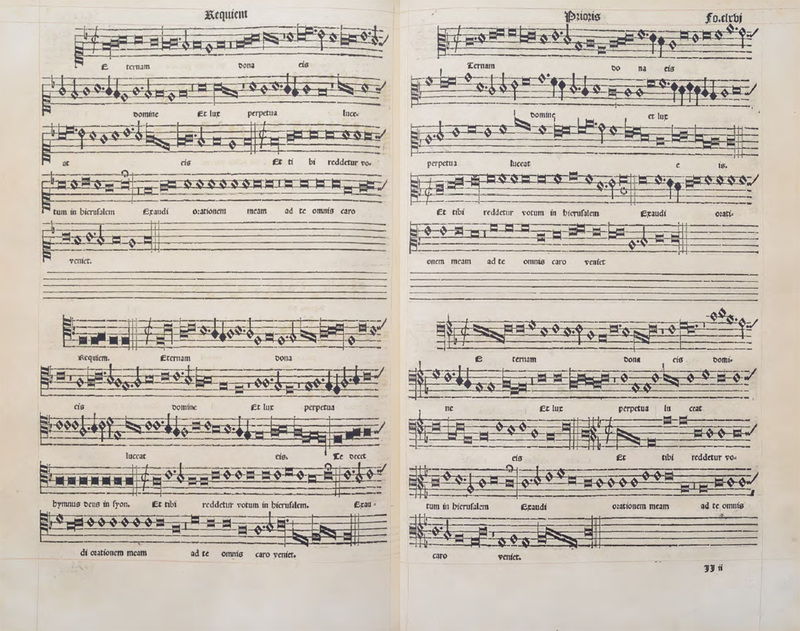 Sixteenth-century composers throughout Europe continued to use the foundational polyphonic idiom popularized by Josquin and other late-fifteenth-century composers while also introducing new features and changing it to suit new purposes. The Reformation and Counter-Reformation directly influenced the character of the sacred music produced during this period, resulting in songs of worship composed in vernacular languages, such as the German chorales performed during Lutheran services. In Italy, Giovanni Pierluigi da Palestrina became a master of Counter-Reformation liturgical music, particularly in the form of polyphonic masses. Two Musicians Playing the Violin and the Lute, from The Small Wedding Dancers series, 1538, Heinrich Aldegrever. New York, Metropolitan Museum of Art, 66.529.60. Lute, Sixtus Rauchwolff, 1596, made in Augsburg, Germany. Rosewood, ivory, wood, ebony. New York, Metropolitan Museum of Art, 89.2.157. In England, the composer William Byrd (1540–1623) worked not only for the Catholic Church, producing works in Latin, but also for Queen Elizabeth I, for whom he created secular songs in English and sacred music for Anglican services. 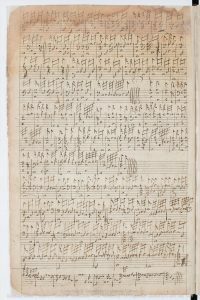 A manuscript dated to 1591 survives that preserves a collection of Byrd’s compositions, entitled My Ladye Nevells Booke. The collection was likely intended as a gift for Elizabeth Bacon, a member of the Neville family whose coat-of-arms can be seen on the title page. 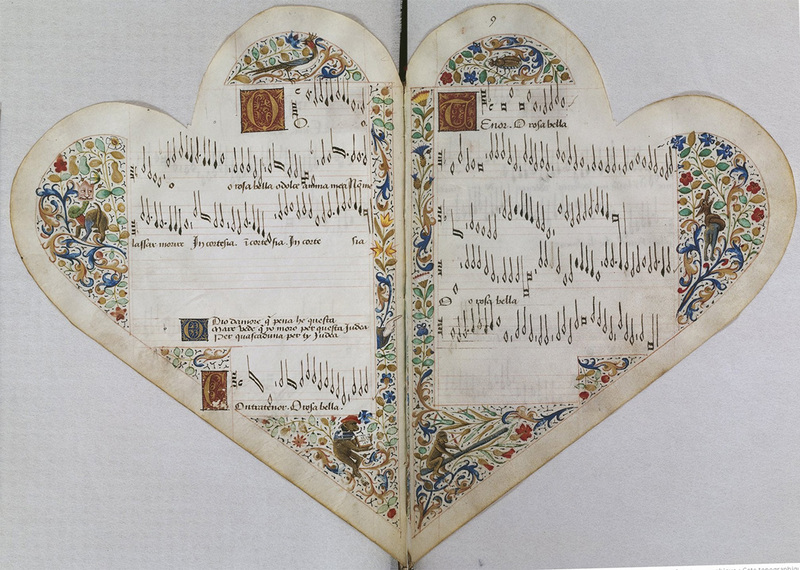 Above: Hear a selection from this manuscript, My Ladye Nevels Grownde, performed by Elizabeth Farr on harpsichord. 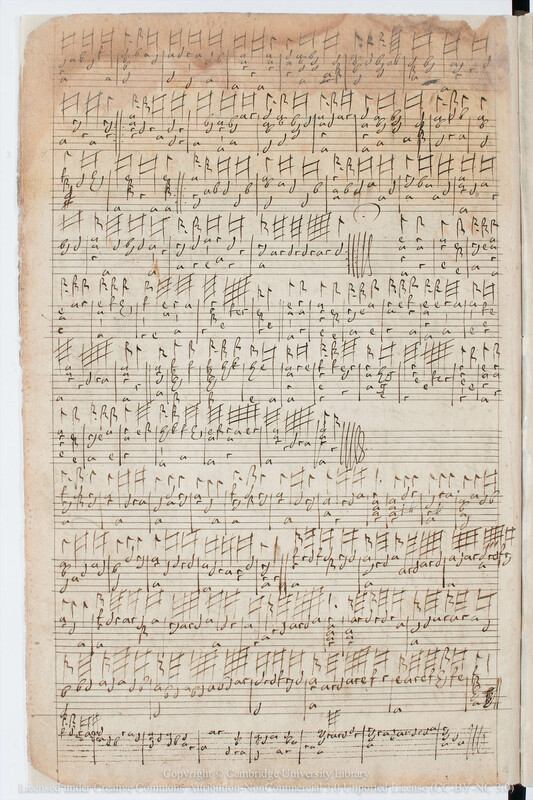 Turn the pages of this manuscript, and hear more musical clips, visit the digital facsimile on the British Library website. 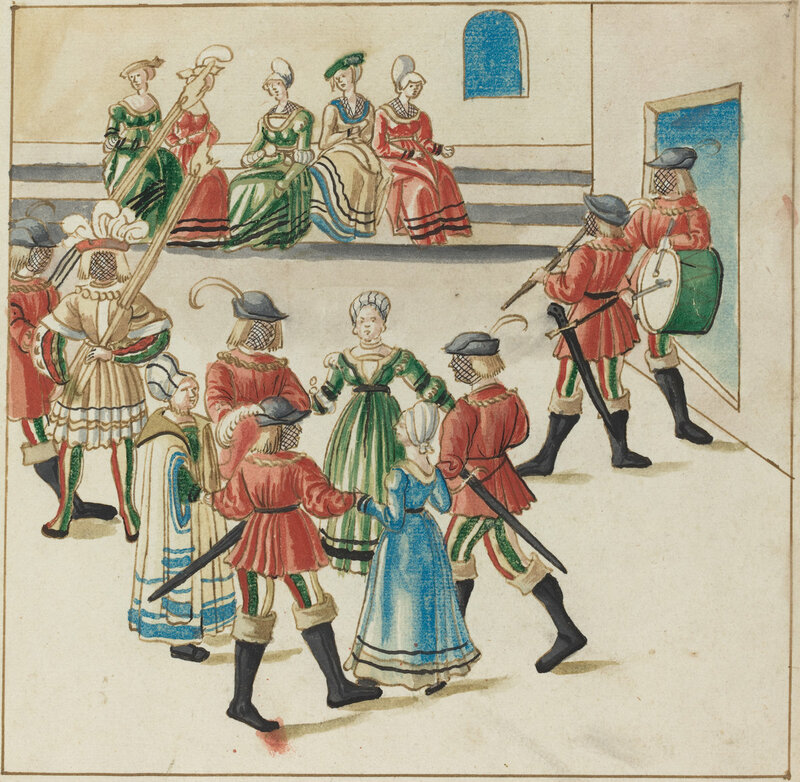 Over the course of the sixteenth century, instrumental music in particular developed into a number of new types, many of which were intended for the dancing that was also a ubiquitous courtly activity and a necessary skill for socially-adept courtiers to cultivate. 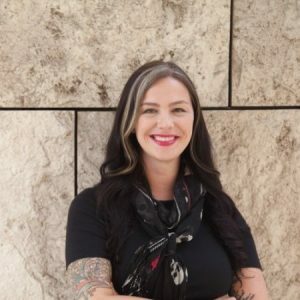 These pieces were composed for soloists and ensembles alike, and became quite their own genre, separate from vocal music and pieces intended for church. Working in the style of Josquin, Flemish composer Nicholas Gombert was employed at the court of Emperor Charles V as a singer in his court chapel in 1526, and possibly also as a composer. 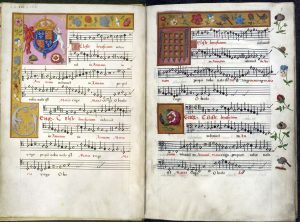 In 1529 Gombert is documented as master of the singers of the royal chapel; in this position he and the singers traveled throughout Europe, helping to spread the Franco-Flemish tradition to the Iberian Peninsula. By the time of his death, Gombert was one of the most renowned composers in Europe, famous for his masses as well as his secular chansons and instrumental works. Linked below is a type of song called a ricercare (Italian for “to seek out”), a complex type of instrumental composition in which melodies are repeated in several different permutations, credited to Gombert. The ricercare, a term often used interchangeably with the canzona and fantasia, is an early type of fugue, which would later be popularized in the Baroque music of Johann Sebastian Bach and others. As a court lutenist, though, Dowland, like his contemporaries, was also tasked with composing dance music, particularly the galliards that were one of the most popular Renaissance dance types, performed by courtiers all over Europe from England to Italy. A highly athletic dance comprised of four hopping steps and a fifth leaping one, the galliard (French for “lively”) was accompanied by similarly up-tempo music. Instructions for performing the “double branley” dance; Orchesographie: Et traicte en forme de dialogve, par leqvel tovtes personnes pevvent facilement apprendre & practiquer l’honneste exercice des dances France, 1589. Washington, D.C.: Library of Congress, 55003658. 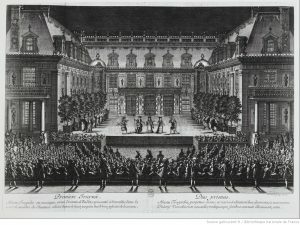 The French court of Versailles under King Louis XIV gained a reputation for its extreme ostentatiousness in all things, and music was no exception. The composer Jean Baptiste Lully (1632–1687), named superintendent of royal music and music master of the royal family when Louis XIV ascended the throne in 1661, helped to shape the sonic character of the court with his lively instrumental arrangements and court ballets. 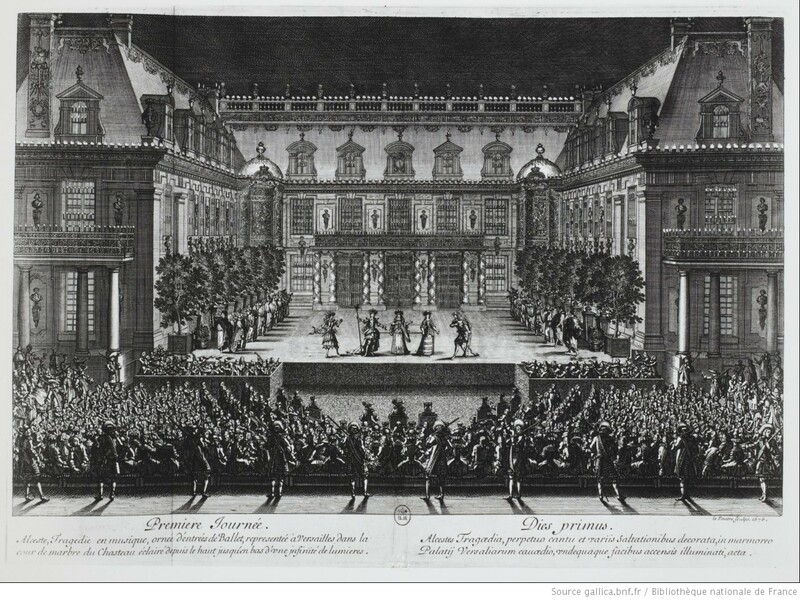 One such ballet, the Ballet des saisons, was performed at the royal palace of Fontainebleau on July 23, 1661, near the beginning of a long career that transformed the style of dance and its great popularity at the French court. Above: Hear La Folia Barockorchester perform Ballet des saisons by Jean-Baptiste Lully and read the digitized score. Just as it is today, music was an essential part of life and entertainment in the late medieval and Renaissance periods. Musical accompaniment was ubiquitous when socializing, dancing, praying, and mourning, and exerted considerable influence on its audiences. Next time you queue up a playlist, take a moment to think about the power of music to shape experience. This entry was posted in Art History, History, Music, Renaissance. Bookmark the permalink.